Want a beautiful new bathroom without all of the stress? Relax, we’ll take care of it all. All Bath Concepts is your one-stop source for designer quality bathroom remodeling at affordable prices. With our Beautiful Bathroom Packages, we are able to offer you an affordable remodel with skilled craftsmen, and great service for your project. Better yet, our packages can include all materials, carpentry, painting and plumbing work to give you the bathroom of your dreams without the stress of a traditional remodel. Our showroom design consultants can assist you in selecting the elements of your new bathroom. From bathtubs and showers to flooring, bathroom cabinetry, to painting let our staff handle the details to help you create a bathroom of distinction. All work is performed by our in house craftsmen, no subcontractors. Only top-quality products and brands are used to give you the bathroom of your dreams for a lifetime. From basic to designer looks, and classic to contemporary- options are available to fit your tastes and style. From basic necessity to long awaited luxury, you can select from a wide range of product lines to customize your new bathroom. We can work with you to select the right cabinet solution to greatly improve storage capacity and to make your new bath more useful and up to date. 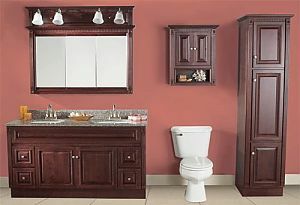 Select from a complete line of quality constructed bathroom cabinetry in your choice of styles, finishes, colors, woods, laminates, moldings and hardware. 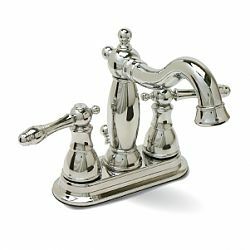 Coordinate with our line of vanity tops, faucets, and flooring. No matter what decorating style you choose for your bathroom, our natural designs will harmonize with any décor. With a wide variety of slate, marble and stone looks to choose from, your decorating options are unlimited. Scotchgard Protector – Easy to clean with the added benefit of Scotchgard™ Protector built into the surface for the ultimate in stain and soil repellency. 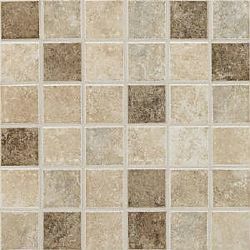 Durability- Stands up to wear and tear - More durable than ceramic tile and with more slip resistance. Silver Antibacterial Protection –With nature’s own antibacterial protection of silver built right in to guard against bacteria, mold and mildew cleaning your new floor will be a breeze! Warmth – No more tiptoeing around the room in the winter, flooring is significantly warmer than ceramic and other natural stones. Quiet – Overall construction absorbs sound and creates a more peaceful and serene bathing atmosphere. Installation Choices – Can be installed with grout for the look of traditional ceramic and stone or without grout providing a fresh and distinctive upscale visual. Can be installed over old flooring or new sub-floors. Speed of installation – A typical installation can be completed in about half the time it takes to complete a comparable ceramic tile installation with less disruption and demolition. 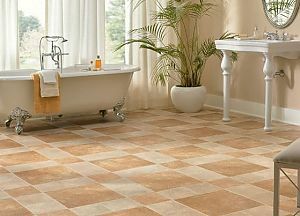 Tile Size & Layout – Available in larger scale tiles providing you with the dramatic look of today’s upscale floors. 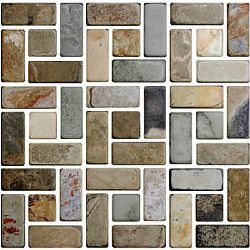 Choose from 16” x 16” Tiles in a large selection of colors. Staggered or Traditional Square Set Available.